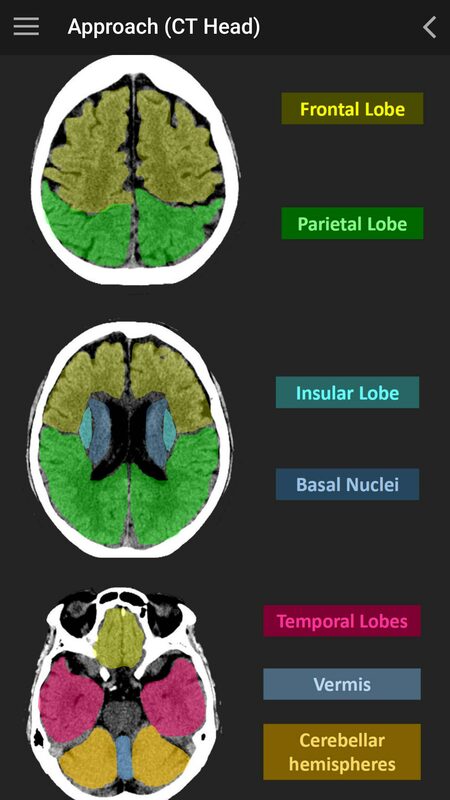 reading images and a quiz for learning which tests to order! 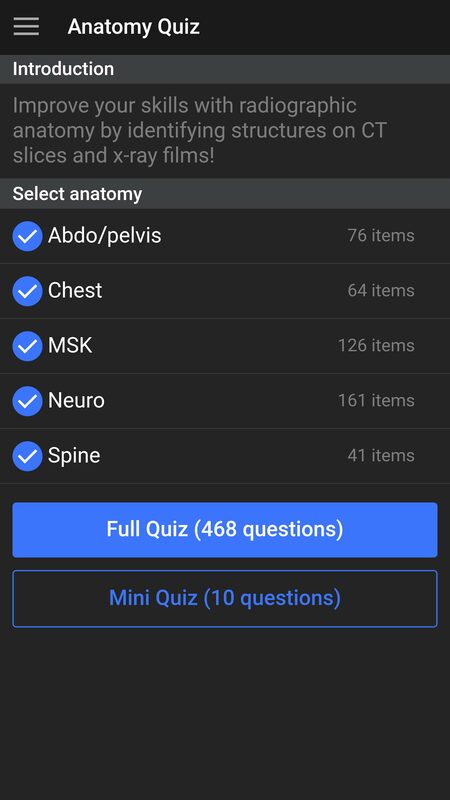 There are 500+ anatomy questions including x-ray, CT, MRI and ultrasound. 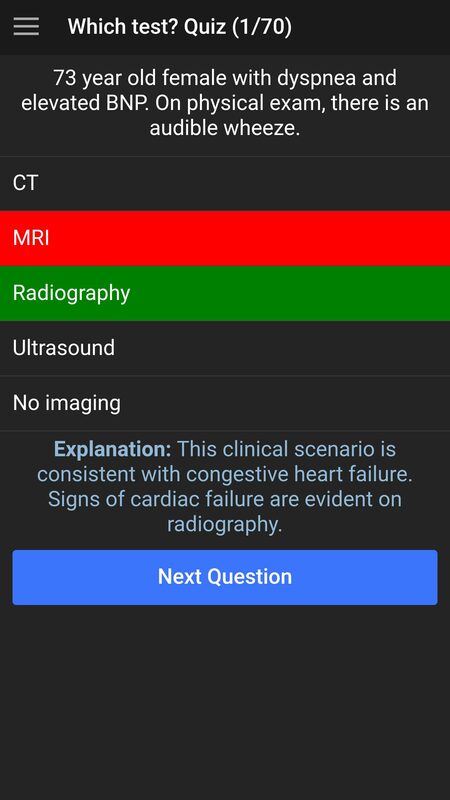 Tackle a quiz that teaches you which tests to order depending on the clinical scenario. 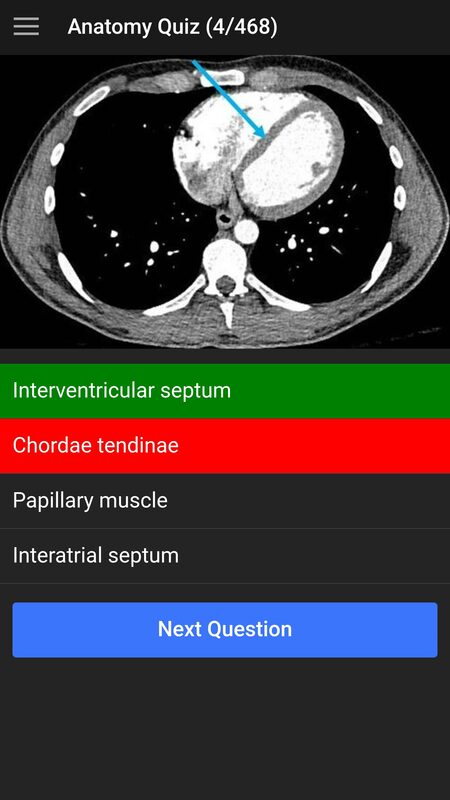 Work your way through realistic and comprehensive teaching cases with detailed answer keys. 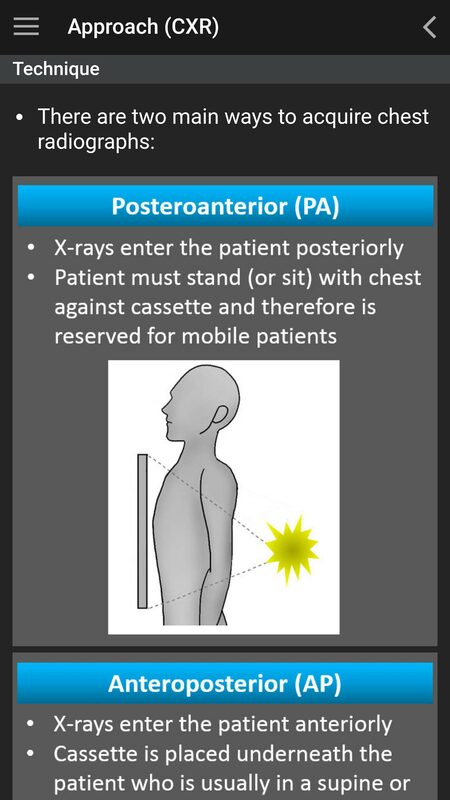 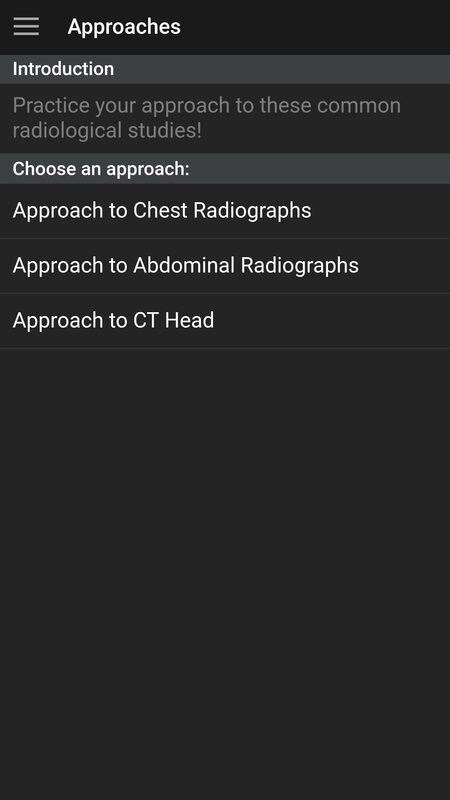 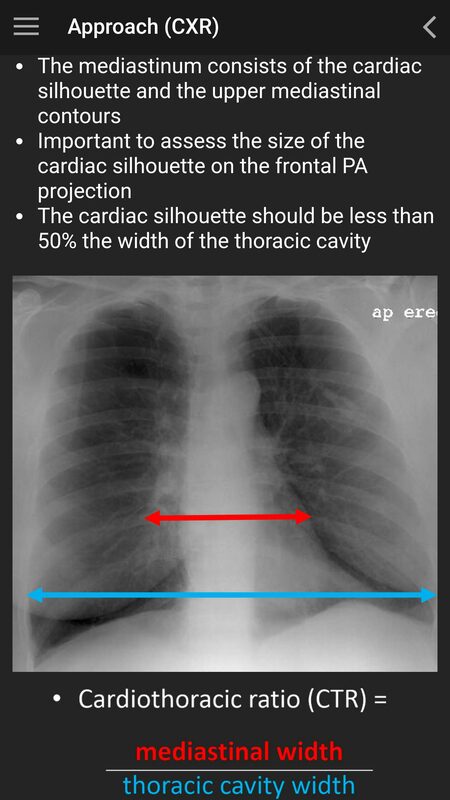 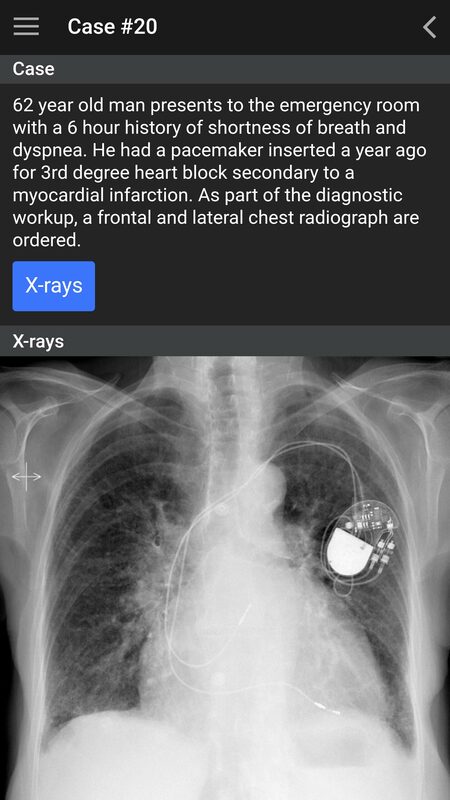 Practice your approaches to abdominal x-ray, chest x-ray and head CT.
Who is this app meant for? 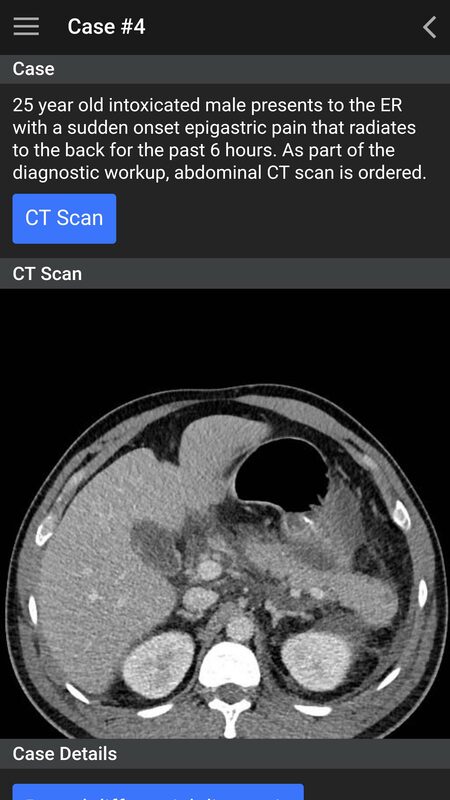 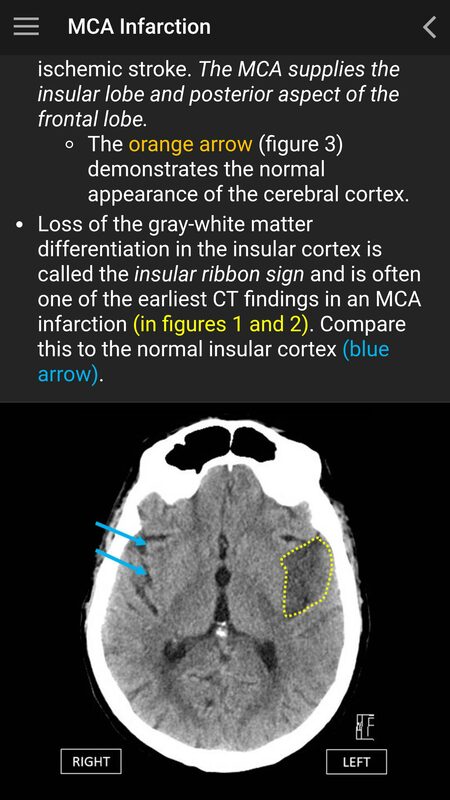 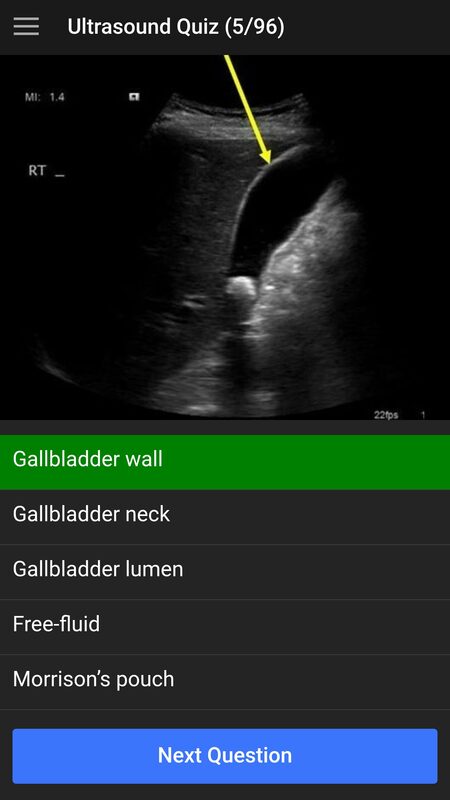 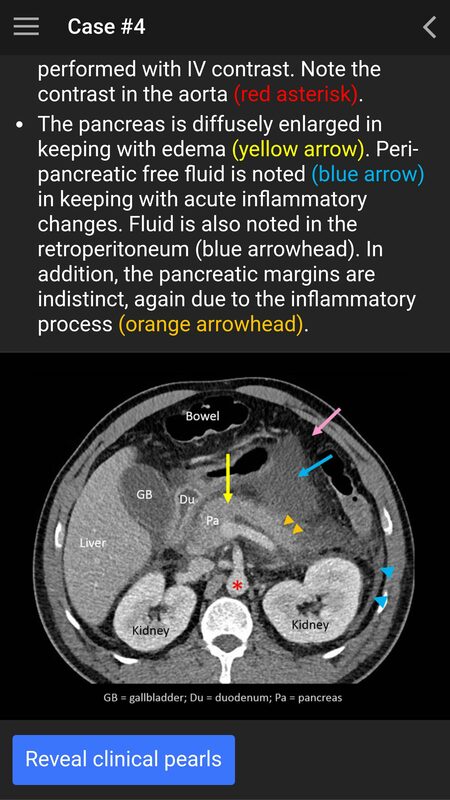 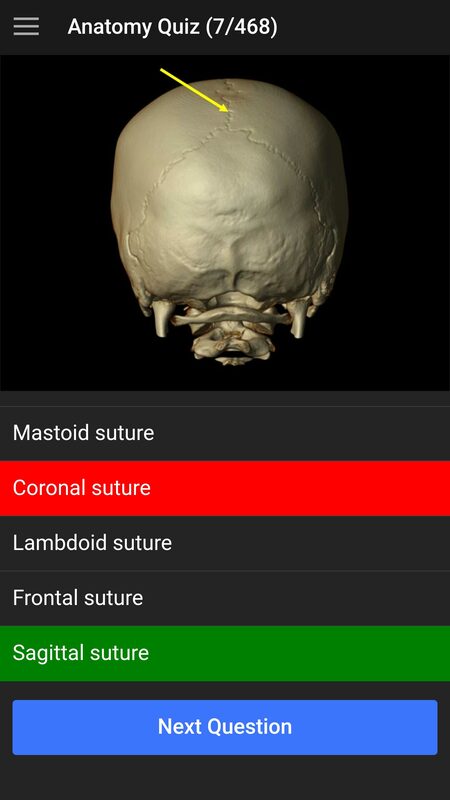 This app is designed for medical trainees and medical professionals to increase their confidence in identifying normal anatomic structures, ordering the most appropriate imaging test and identifying common pathology. 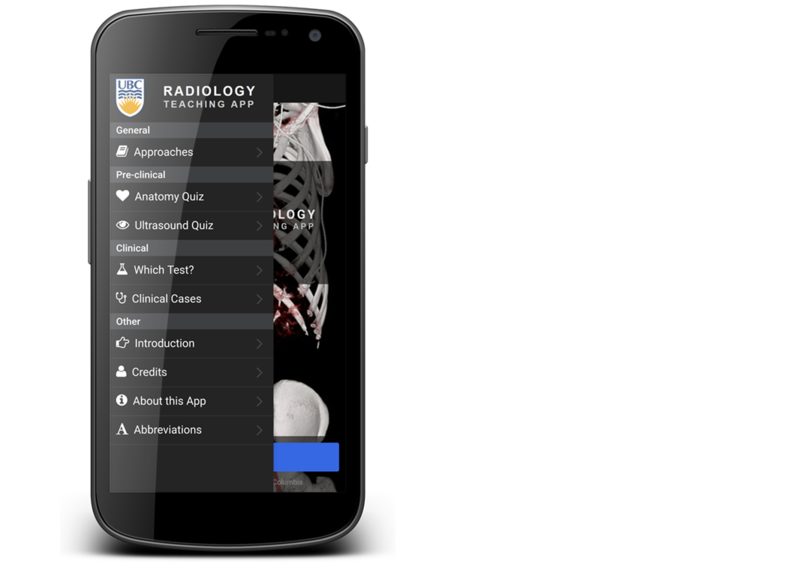 The app was developed entirely "in house" at the University of British Columbia by a team of faculty, residents and medical students. 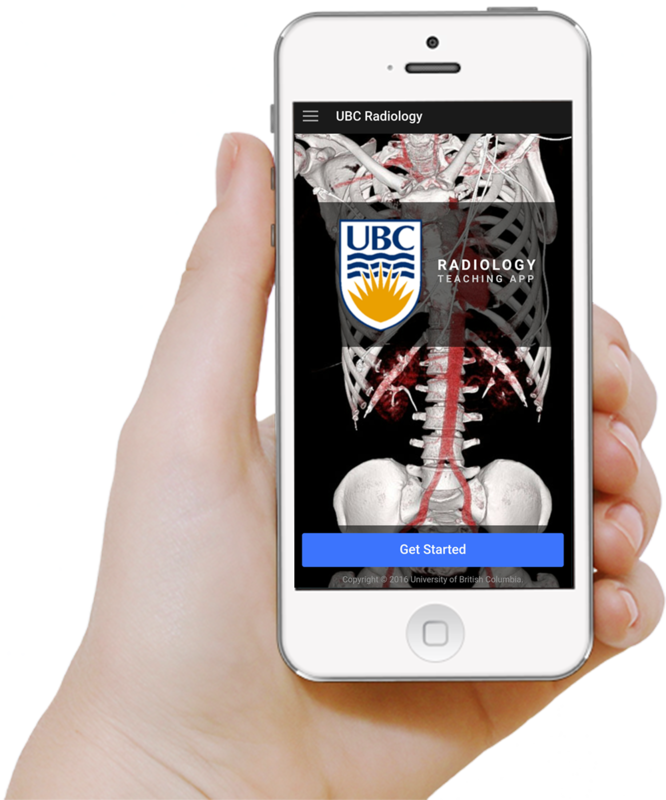 The app was funded by a UBC Teaching and Learning Education Fund grant, which allows us to offer it as a free resource worldwide. 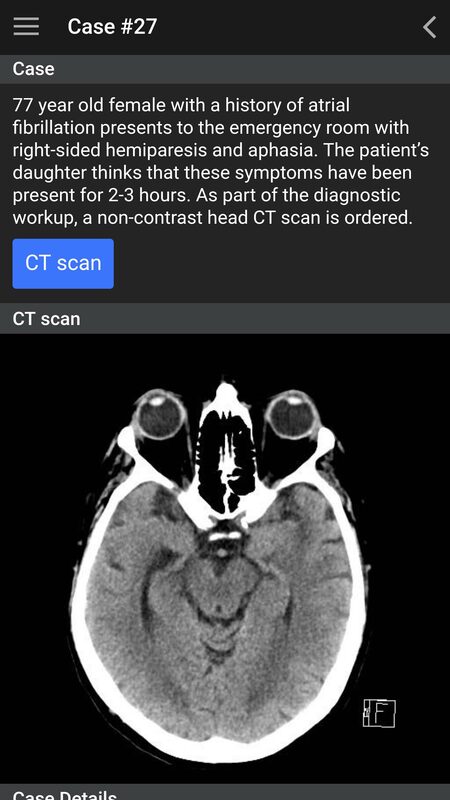 This app is available for free to anyone with a compatible Apple or Android device. 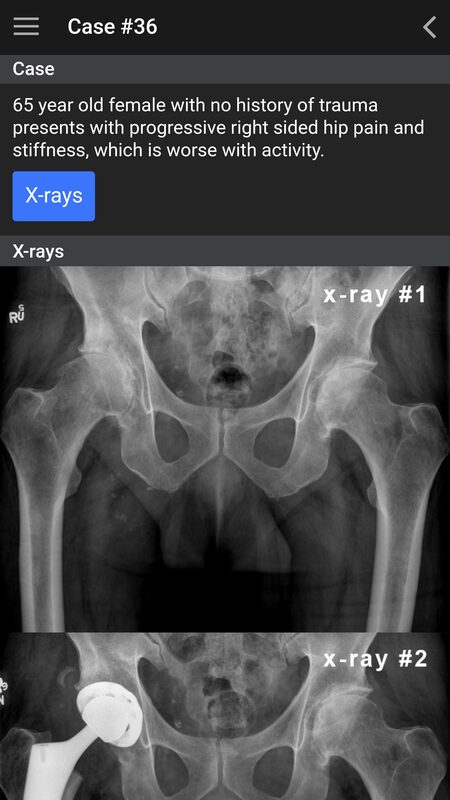 Our goal is to improve accessibility to high quality resources for learners everywhere. 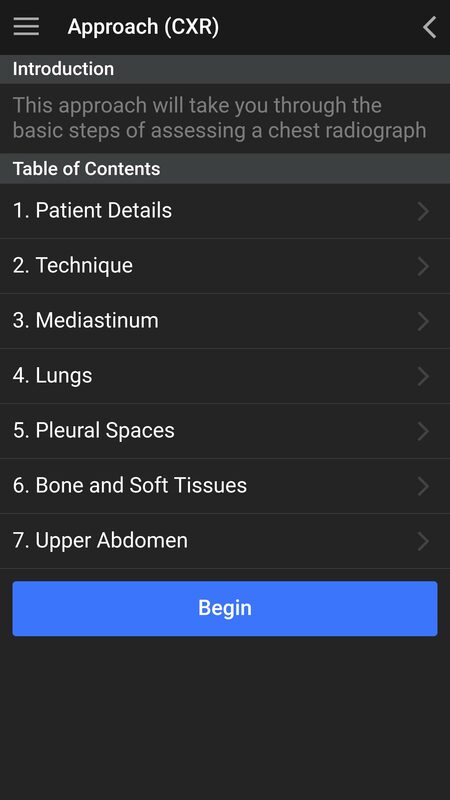 The app has been developed to take into account validated instructional design models for whole task learning in medicine. 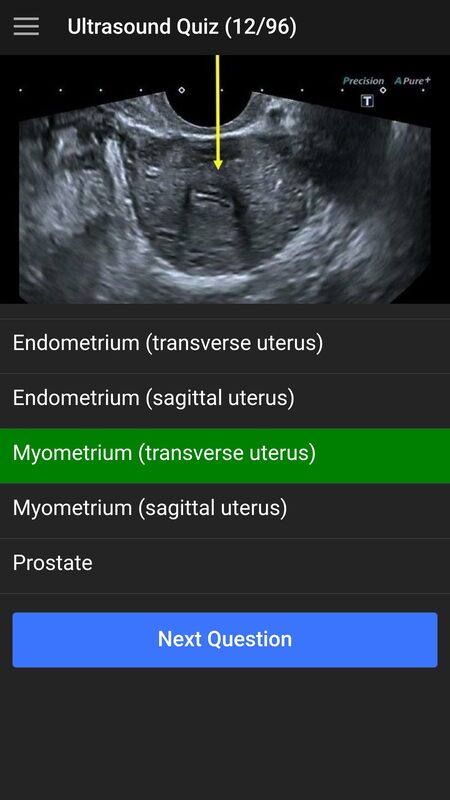 Based on established theory, the app is designed to promote discovery learning. 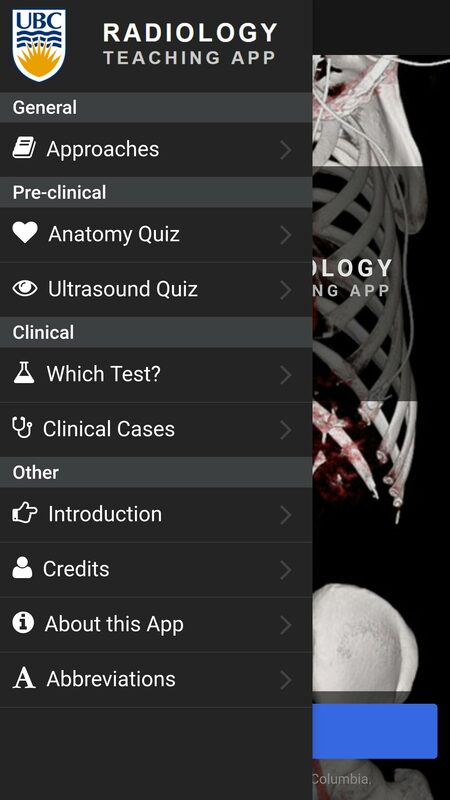 How is the app related to the University of British Columbia medical curriculum? 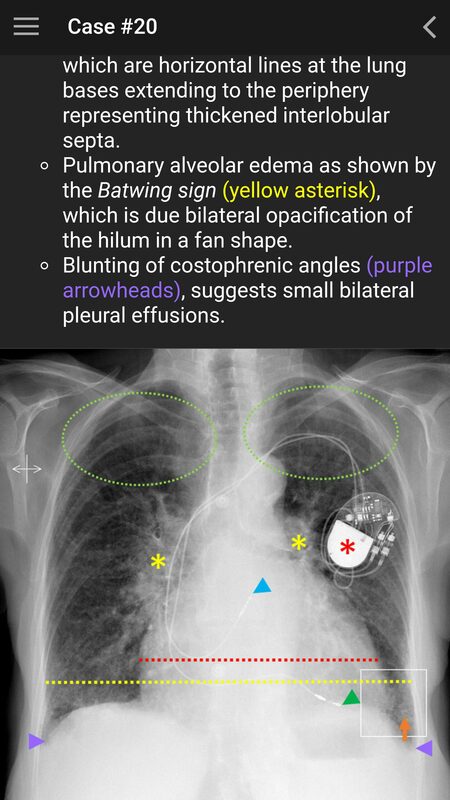 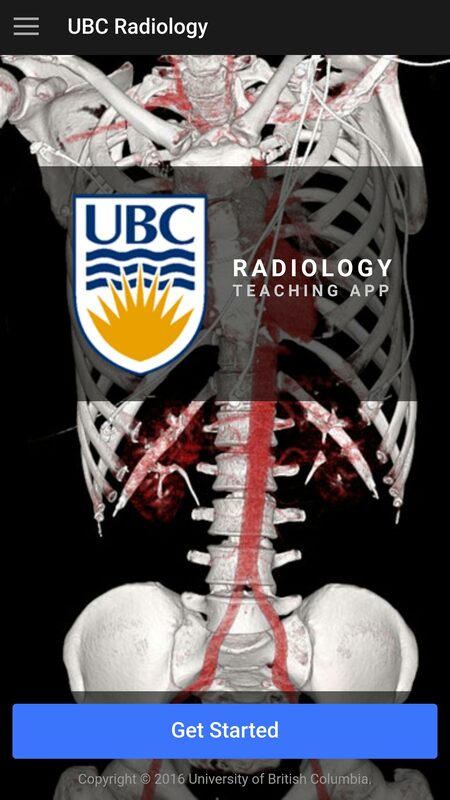 This app is based on the radiology undergraduate curriculum at the University of British Columbia (UBC), which is located in Vancouver, British Columbia, Canada. 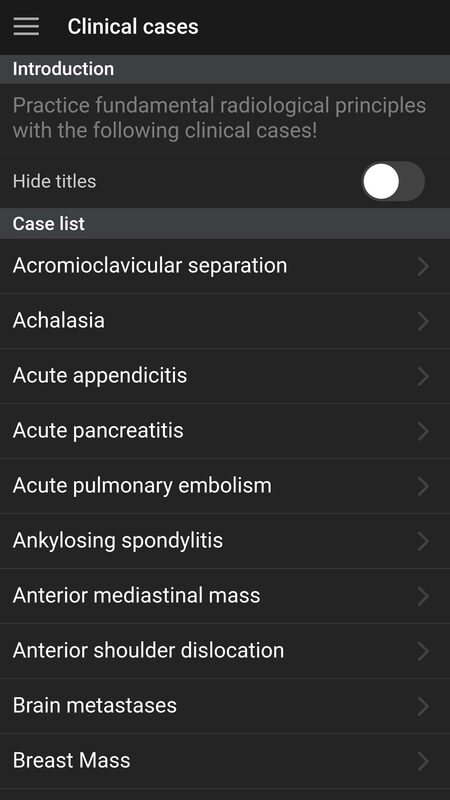 The app content is organized into the pre-clinical (MS1, MS2) and clinical (MS3, MS4, intern) years. 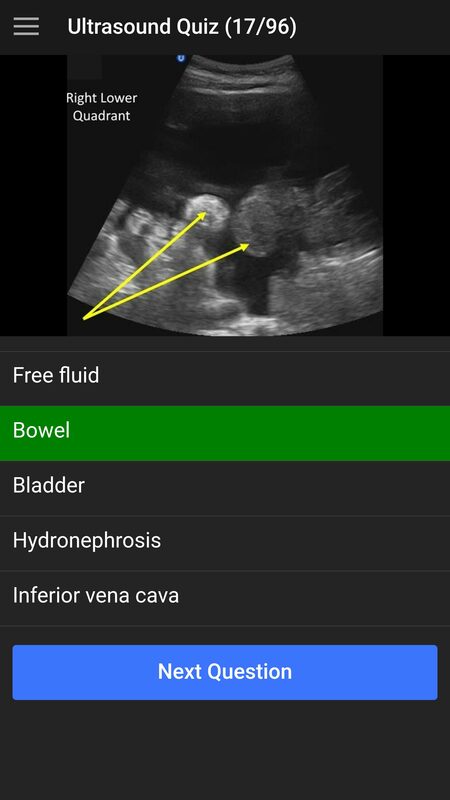 The focus of the pre-clinical years is on identifying normal anatomy and acquiring basic ultrasound skills and the focus of the clinical years is to become familiar with ordering appropriateness criteria and to recognize key pathology. 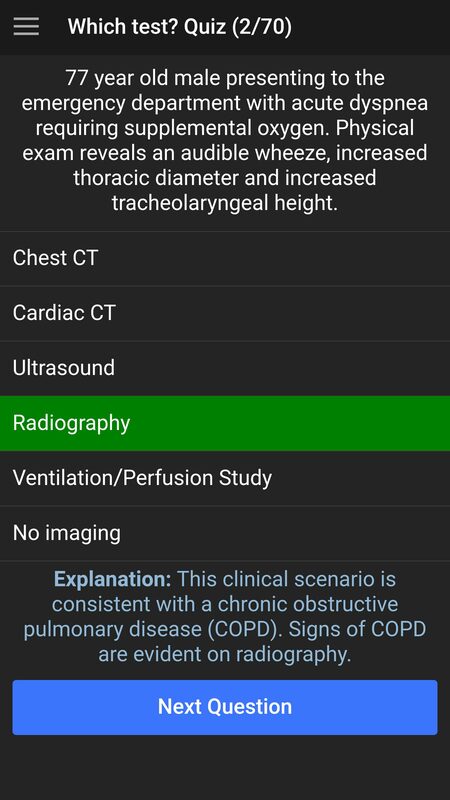 The list of clinical cases presented in this app are developed from the UBC third year medical student clerkship "Must See" clinical objectives. 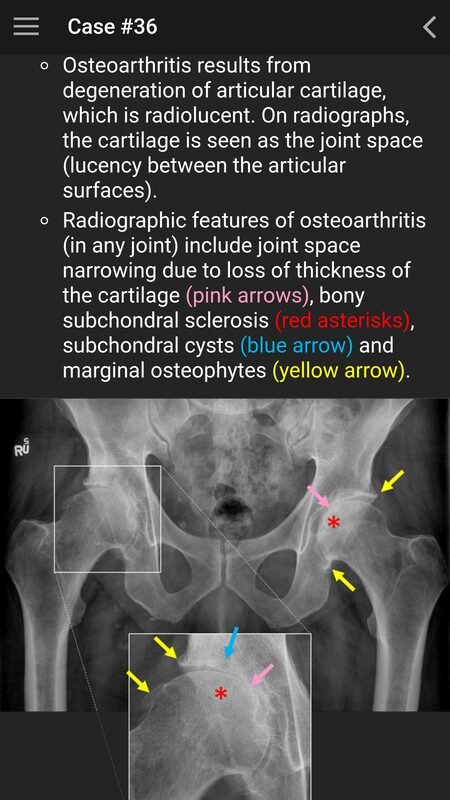 Many of the cases include pathology correlation which allows students to integrate the radiology findings in disease with the pathological appearance. 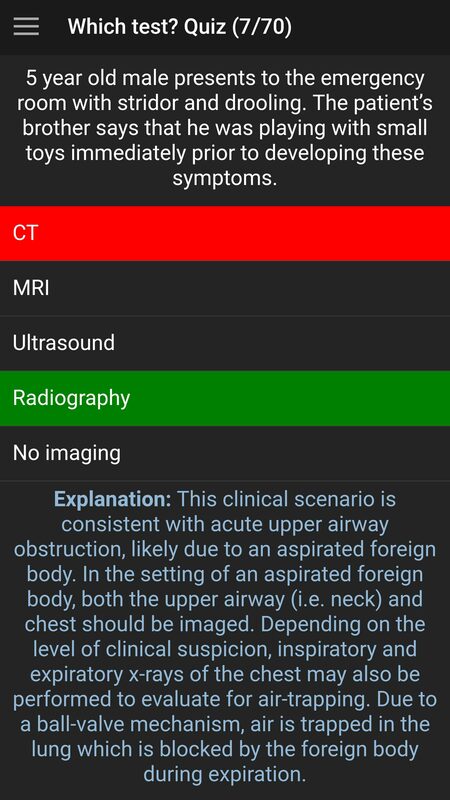 How is the app related to standardized radiology curricula? 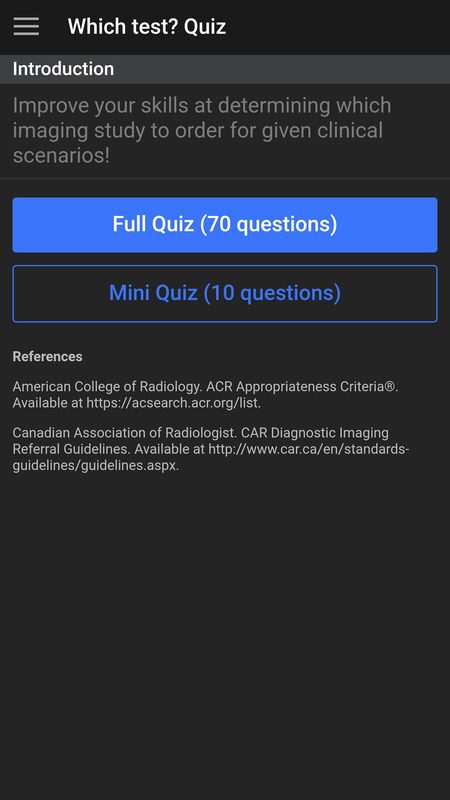 The learning objectives integrated into this app are based on the undergraduate radiology objectives developed by the major radiology societies including the Alliance of Medical Student Educators in Radiology (Association of University Radiologists), European Society of Radiology and the Canadian Association of Radiology. 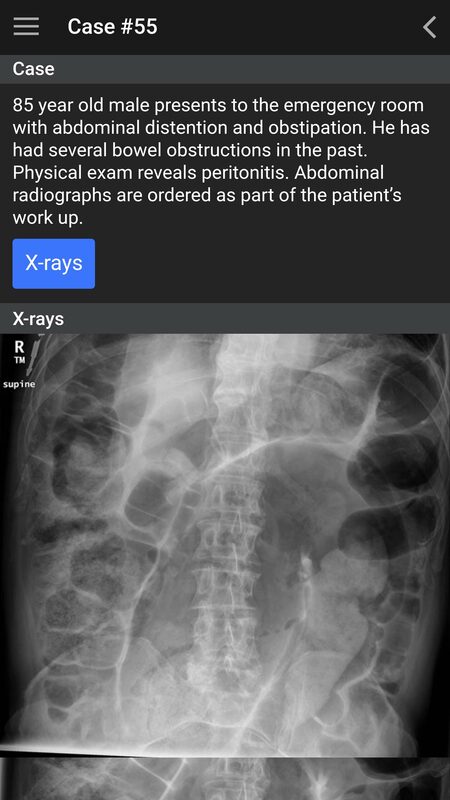 Every great app has a great team behind it! 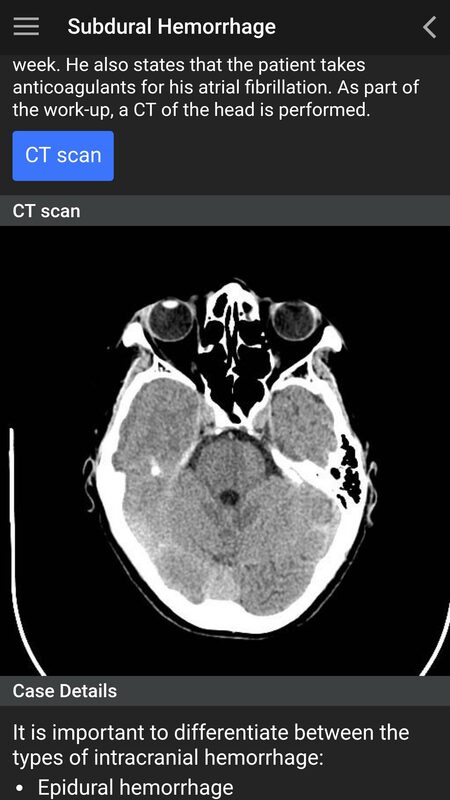 Watch our official promo video! 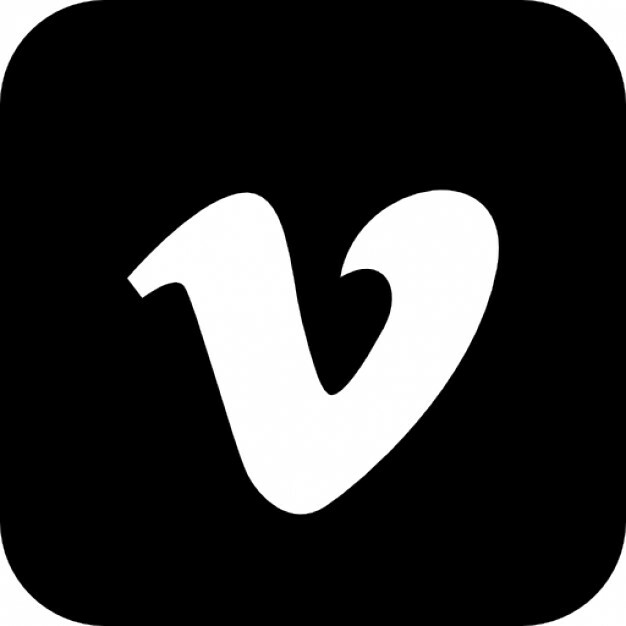 Click the Vimeo logo to view our promo video! 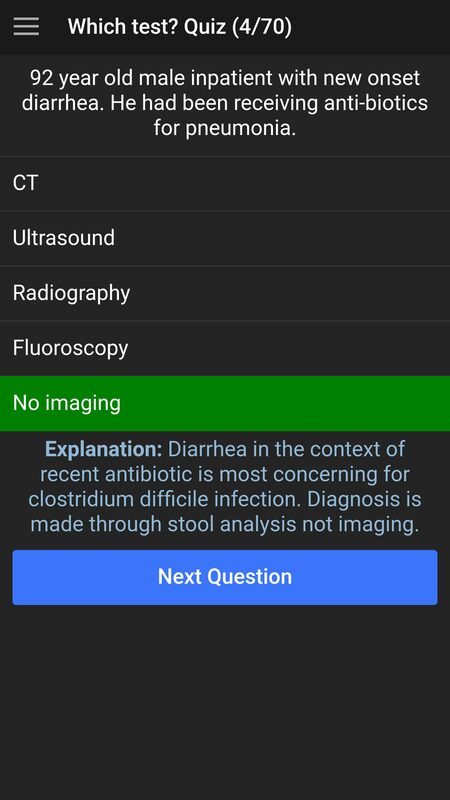 See what this app has to offer!